Given the exceptional desirability and rarity of complicated watches by Patek Philippe it’s reasonable for collectors and connoisseurs to think there are few if any surprises left in the field, but that belief was overturned by the presentation by Christie’s, for its June 11th auction, of a timepiece that had until the auction never before been seen in public, and which precedes what had been thought to be the earliest date for a Patek Philippe Grand Complication by a dozen years. The watch in question is the Stephen S. Palmer Patek Philippe Grand Complication. 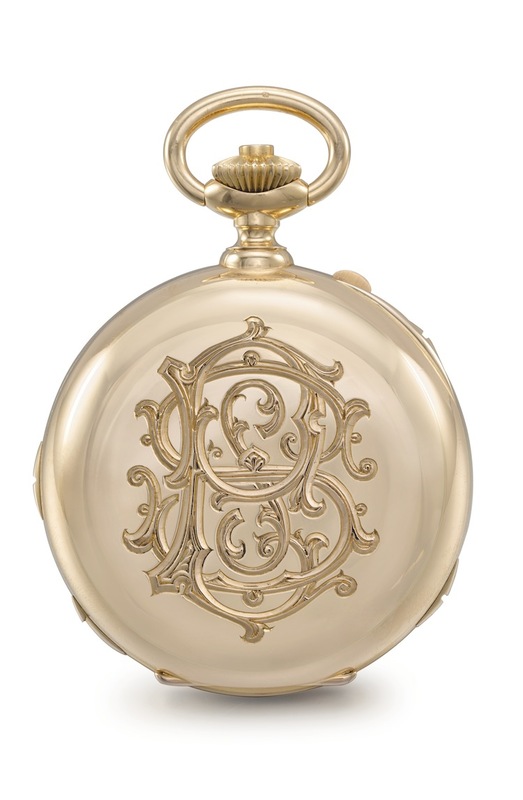 The watch was made for industrialist Stephen S. Palmer, President of the New Jersey Zinc Company, and Director, with Cornelius Vanderbilt, of the Lackawanna Steel Company; he was also a Trustee of Princeton University from 1908 to 1913. Completed in 1898, the watch was originally sold to Mr. Palmer in October of 1900 for 6,500 Swiss francs; the purchase was made during a trip to Geneva during which he also purchased two other complicated watches from the firm. 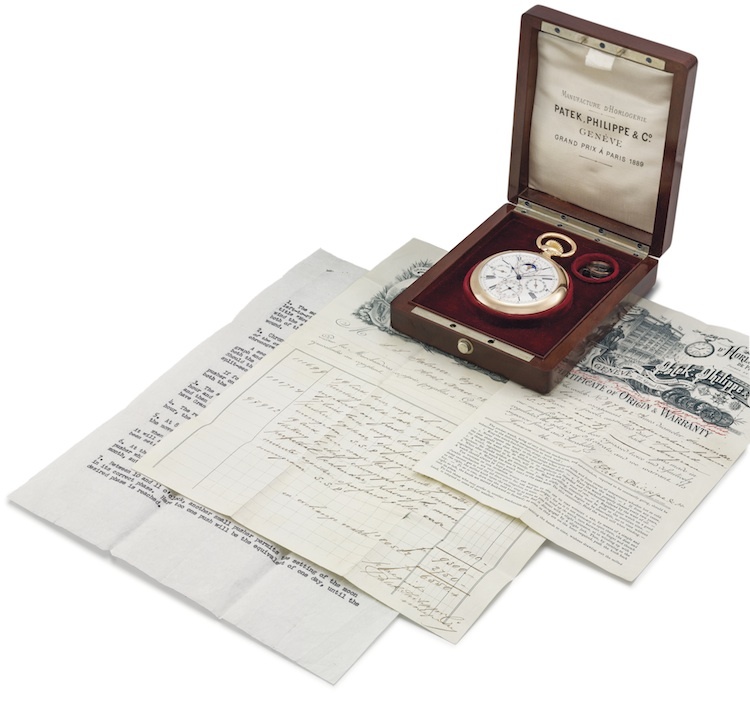 The condition and provenance of the watch are both impeccable; according to Christie’s, the watch appears to have been kept in a vault in Mr. Palmer’s Princeton home and scarcely if ever used; it was accompanied at the auction by the original invoice and presentation box. The watch, no. 97912, is a minute repeater, perpetual calendar, split-seconds chronograph, with grand and petite sonnerie, showing the age and phase of the moon, and is cased in a massive 18k pink gold case. 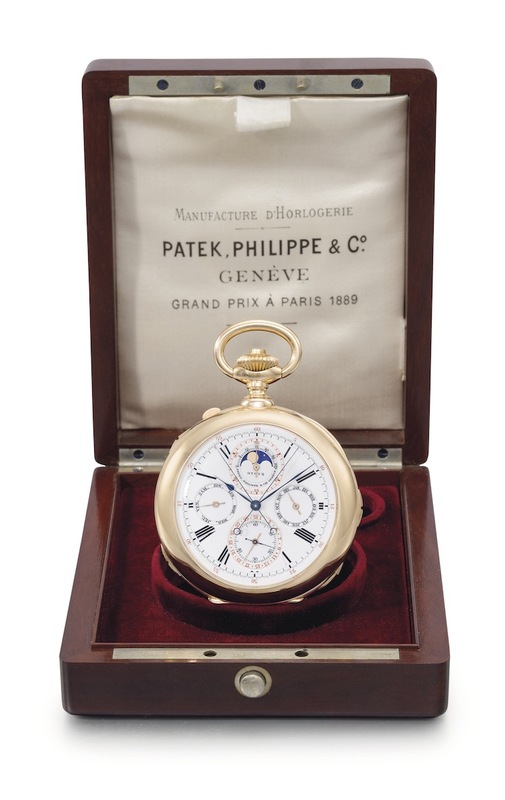 The high estimate for the watch was $1.5 milliion; it was sold June 11th for a staggering $2.251,750 –a world auction record for a Patek Philippe Grand Complication. The watch, which was accompanied by an offiicial extract from the archives of Patek Philippe, was purchased according to Christie’s by a private American collector, and its sale price represents a new world’s record for a Patek Philippe Grand Complication. 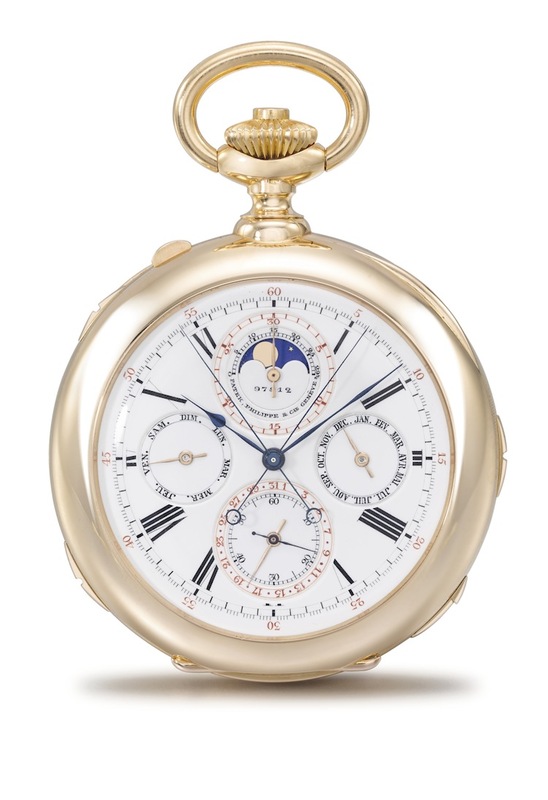 NB –though this is a record for a classic Grand Complication (repeater/sonnerie, perpetual calendar, and rattrapante chronograph) the all-time record for a complicated Patek watch remains the Graves Supercomplication, a 74mm clockwatch with astronomical complications, auctioned by Sotheby’s for $11million, in 1999.